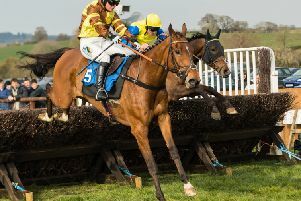 Mister Fizz is the latest horse to signal approval of the Edgcote air by winning at Southwell on Sunday for trainer Alex Hales. About the time France made it 2-1 with a penalty in the World Cup Final en route to their 4-2 success over Croatia, the ten year-old, which once graced the Cheltenham Festival in the 2016 Coral Cup, was powering to a three-and-a-quarter length success in Sunday’s Nottingham City Transport Handicap Hurdle. Without resorting to VAR, the word ‘penalty’ is one which Hales now fears most, anxious to know how much extra weight Mister Fizz will shoulder when re-assessed by the handicapper. “Mister Fizz has only been with us for six weeks,” explained Hales. “Imogen Pickard has given up training, having the bigger priorities of a young family. David Fitzgerald, the racecourse commentator was involved with us and Crafty Roberto, and helpful in the horse coming to us. “Mister Fizz hadn’t won for almost three years but has been rated up in the 140s in his time. There were 40 lengths clear to the third horse at Southwell so I am fearful what the handicapper might do. Trainers’ eyeing the skies for rain remains a common theme at present and the Trafford Bridge handler would like some juice in the ground for both The Drone and Methag who both showed winning form in May and June. The Drone, an outsider of three when scoring under Sam Twiston-Davies at Stratford, is a possible runner back there on Sunday. Methag, a scorer at Doncaster on the level before finishing a runner-up over hurdles at Market Rasen, could go to Lingfield over 1m 6f on Saturday night or possibly Stratford over timber on Sunday. Recent dual winner Panko is having a short mid-summer break but is expected to return in the second week of August while five year-old The Otmoor Poet, developing a love affair with coming third, a position he has occupied on his last four attempts, could go to Leicester next Wednesday evening. Each-way backers take note!